A business shouldn’t have to worry about technology as a hindrance when it should be focused on strategic growth. Your resources should do what they do best and focus on the core business goals. And yet, organizations face the daunting problem of ever more people to support and ever more complex networks to manage — with the simultaneous pressure to reduce costs while doing more with less. Many business leaders are tasked with managing explosive data growth, aging technology, and disaster planning while trying to balance time to focus on business innovation. This is where Contour Data Solutions comes in. We provide flexible infrastructure solutions and Expert Services to meet the challenges of doing business in today’s data-driven economy. Our strategic data solutions are composed of best-of-breed technologies and expert integration, complemented with exceptional consulting services. We enable your company to address universal challenges such as tiered storage optimization, backup & recovery management, regulation compliance, specialized branch office solutions and virtualized infrastructures. As the world is redefined by technology, creating new priorities for every business and driving new imperatives for every IT organization, Contour speeds our customers’ digital transformation, empowering them to compete and succeed with software that reinvents the foundation of computing and mobile user experiences. Contour lets customers use any cloud they choose, end-to-end security solutions, and simple, secure digital workspaces, our data solutions and services enable customers to build exactly what they need, the way they need it for today and tomorrow. Contour helps companies accomplish the key missions that move them forward, freeing them to shape an unlimited future. These key missions align with four strategic IT priorities: Modernize Data Centers, Integrate Public Clouds, Empower the Digital Workspace and Transform Security. Your Contour Account Manager and certified specialists are ready to assist you with every phase of choosing and leveraging the right solution for your IT environment. Using a proven service engagement methodology and consultative approach, the Contour team identifies customers’ business goals, budget constraints, and technology integration issues to develop a winning strategy. Reduce the cost and complexity of managing data, improve business agility and leverage your company’s core asset – your data. Contour provides increased intelligence, protection, and flexibility to help simplify the tasks involved in Data Management. We also simplify the infrastructure on which information resides while increasing the value of this information; however, this information requires IT departments to spend most of their resources managing the existing infrastructure. This challenge often translates into IT departments only being able to apply 20% of their resources to new business opportunities. In response, Contour has pioneered information lifecycle management (ILM) software along with our Implementation Services to help organizations store, manage, protect, and share information. Store Intelligent storage frees up IT resources for increased innovation and lowered costs through Tiered Infrastructure, Storage Management, and Policy-based Movement. Managed Resources management provides agility so that IT can capitalize on change instead of avoiding it through Modeling, Virtualization, and Orchestration. Protect Information protection ensures that information is always an asset – never a liability – through Replication, Recovery, and Security. Share Information sharing empowers the business to maximize the value of information through Collaborative Processes, Content Services, and Repository Services. Helping businesses define the approach and implement the required resilience to protect your critical systems in the event of a disaster. Contour Data Solutions has implemented and executed thousands of Disaster Recovery and Business Continuity solutions. Contour delivers a comprehensive, integrated portfolio of DR/BC solutions that provide high availability, data protection and recovery services. We work with your team to understand your business requirements and the impact of data loss so we can design a solution to minimize your Recovery Time Objectives (RTOs) and Recovery Point Objectives (RPOs). Whether you’re looking for on-premise, cloud or a hybrid strategy, Contour will design and implement a custom solution to meet your needs. Contour delivers the next generation of continuous availability for the always-on enterprise, providing business and enterprises of all sizes with the means to ensure availability for any application and any data sets. Businesses rely on their data and you can rely on Contour to ensure its always secure and always available. 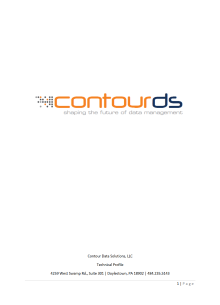 The experts at Contour Data Solutions simplify the backup and recovery process. We work with your team to understand your business requirements and the impact of data loss so we can design a solution to minimize your Recovery Time Objectives (RTOs) and Recovery Point Objectives (RPOs). Whether you’re looking for on-premise, cloud or a hybrid strategy, Contour will design and implement a custom solution to meet your needs. Reduce backup windows and recovery times by leveraging Contour’s Backup and Recovery Services. Contour delivers the next generation of availability for the always-on enterprise, providing business and enterprises of all sizes with the means to ensure availability for any application and any data, across on-premise, cloud and hybrid solutions. Strike the right balance between leveraging existing infrastructure investments and tomorrow’s leading-edge technology. Whether you are setting up a new IT infrastructure, replacing an aging network or expanding network capacity, you can rely on Contour to provide the design and delivery skills required to transition from a legacy environment to a fully redundant, next generation solution. Our Infrastructure Design and Implementation Services provide proven methodologies and best practices that accelerate your time to market so you can quickly see your return on investment. These services deliver rapid, outstanding design, implementation, and integration services—in every engagement, in every location. 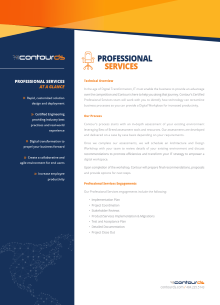 Contour gives clients access to field-tested experts with real-world experience. The end user has become the focus of today’s digital workplace. Individuals are now using multiple devices from various different locations with the expectation that their data is always secure and always available. Contour has helped hundreds of organizations implement strategic EUC solutions that empower self-service to applications for greater flexibility, productivity, and cost savings. Contour’s EUC solutions help you accelerate the transformation and management of your end user landscape leveraging well-defined frameworks, tools and solutions. Connecting consumers and devices to enable a digital world with robust analytics and easy access to data and applications. Connecting everything drives positive business opportunities and results. The pace of change in our world has never been more accelerated. To thrive in today’s business world, organizations must have deeper insight and analytics on their customers’ so they can provide better products and services. Leading companies are moving to digital business models that eliminate information silos and connect machines, assets, and people across the world, and they’re using intelligent networks to get there. Contour provides a secure and scalable framework that includes remotes, dashboards, networks, gateways, analytics, data storage and security for a robust IoT strategy. Creating efficiencies by implementing software-based, or virtual, representation of something, such as virtual applications, servers, storage and networks is the single most effective way to reduce IT expenses and enable agility. IT organizations are challenged by the limitations of today’s physical data center components such as servers, networks and storage which are only capable of running single applications with limited features and functionality. Contour leverages virtualization software to simulate the existence of hardware and creates a virtual system capable of handling exponential feature/functionality eliminating the borders associated with physical hardware. These services provide greater flexibility for business who constantly need to adapt in today’s changing world. Contour enables enterprises to innovate freely in the clouds of their choice. Built on VMware’s industry-leading Software-Defined Data Center foundation which brings together best-in-class compute, storage, networking virtualization, and cloud management, our common operating environment lets you rapidly run, manage, connect, and secure apps across clouds and devices. The software-defined approach extends industry-leading vSphere virtualization beyond compute to network and storage, making data center services as easy and inexpensive to configure and manage as virtual machines. Applications and services can be provisioned and run on both on-premises private clouds and secure infrastructure-as-a-service (IaaS) platforms, with seamless workload mobility across the hybrid environment. You can utilize virtually any hardware, minimizing the need for specialized infrastructure. Unified, policy-driven technology automates and manages IT services across heterogeneous clouds. Unlike legacy solutions, the platform is purpose-built to orchestrate the changing dynamics of software-defined workloads. Designed to meet the needs of mission critical enterprise applications, this fully integrated, engineered, tested and validated solution will help you accelerate your transition to a Software-Defined Enterprise. NSX enables micro-segmentation and granular security of workloads in virtualized networks, isolating sensitive systems and reducing both risk and scope of compliance. Use NSX to help ensure and demonstrate compliant operations with many regulations such as PCI DSS, HIPAA, FedRAMP, SOC, CJIS, DISA STIG, and more. Helping organizations accelerate application deployment and delivery, by providing automated, on-demand application delivery, dramatically reducing IT costs through policy-driven, work-flow automation. From implementing a hybrid WAN, to improving cloud-based application performance, to creating a dynamic security perimeter and rolling out a software-defined network; Contour makes it remarkably easy to build the WAN your business needs at the performance expect. Say good-bye to traditional routing protocols and hello to savings of up to 50% of your WAN costs and an increase of up to 95% WAN throughput. Contour builds a foundation that allows you to combine disparate WAN networks—including MPLS, LTE, and internet links—into a single, high-performance hybrid WAN fabric. Deploy cloud applications and SaaS across your enterprise in minutes and get instant application performance monitoring. Establish a dynamic network security perimeter based on contexts that include groupings of specific applications, users, and/or branch VLANs. Keep contexts secure without re-configuring the network, deploying new hardware, or changing the network topology. A software-defined enterprise (SDE) spans both the data center and the enterprise WAN, so you enjoy the same benefits in the WAN as you’ve come to expect in a SDDC. Reduce hardware costs and support more rapid network provisioning thanks to network virtualization. Leverage Contour’s Contract and Renewals Management team for a better way to maintain and manage your IT support and maintenance contracts. Contour can store all your contracts in one place through our Contracts & Renewals Management Services. Whether you manage a single hardware support contract or hundreds of hardware and software support contracts, Contour can help you manage these assets. Contour has the most experienced, contract management specialists in the industry, making it easy for you to research, select, and execute the right contracts for your organizations. Our experts can manage existing contracts, or help establish new ones that match your needs. We can also monitor each agreement’s expiration date, ensuring you are aware of key renewal dates to continue uninterrupted protection of your organization’s security, support, and compliance. We can support your networks, servers, and storage to ensure you’re getting the right products, under the right agreement, which is readily available to you. Contour contract and renewals management expertise extends to all software & hardware manufacturers, including major brands like DellEMC, Cisco, Microsoft, VMware and many more. From virtualization software to creative software, we have your various contractual needs covered. Contact us today for more information on our Contract & Renewals Management Services! Be prepared. Prevent costly, and time-consuming inconsistencies that me be found during audits. Today’s industry standards require proper documentation of company policies and procedures for business process, sales processes, and IT process to name a few. Proper documentation is key to meeting today’s regulatory requirements and protecting your business from unnecessary work due to inconsistencies found during an audit. Contour streamlines the documentation process by updating existing policies and creating new policies. We can work with you to effectively document your new business processes and quickly identify, outline, and finalize your policies and procedures to ensure your “regulatory readiness”. Standardized and scalable – Implement standards for how content is written, and provide everyone with training so documents are clear and user-focused. Welcoming you to the cloud with white-glove service. Should you move to the cloud? By now, that question has long been answered with a resounding “yes.” Countless companies have begun transferring more and more workloads to the cloud to make themselves competitive in today’s market. While the benefits of the cloud—agility, speed to innovation and lower IT costs – are clear, moving to the cloud can be a complex and disruptive to your business. For this reason, companies need to understand what’s involved in the journey to the cloud, prior to jumping in head first. Contour has helped hundreds of customers design and migrate from on-premise environments to robust cloud solutions. Companies like a leading Credit Card Processing facility that wanted a hybrid cloud solution to handle hundreds of thousands of transactions every month. Or a leading independent energy firm that’s creating a new cloud-enabled operating model to realize its strategic “as-a-Service” vision. Or an Alarm company that was able to save millions on its lease agreement, and contain increasing costs by transferring 90+ workloads and several terabytes of data to the cloud in just a few weeks. Eco-System – The ability to manage and deploy cloud where it makes sense. Cost Analysis – by offering consumption and financial metrics across multiple public and private cloud providers.